To enhance the look of your property, you can install a deck in either your front yard, back yard, or both. Aside from adding to the visual appeal of your house, a deck can also add to the value of your home. And as they look good in any home they are installed in, many home owners opt to have these at their home. Most home owners also spend their time outdoors whether it’s relaxing during the weekdays after a tiring day or entertaining friends on a weekend. And what better way to do all these than on a beautifully decked floor. Even just a simple family activity can turn into a special event. 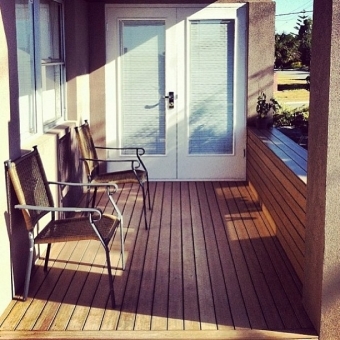 Along with patios, carports and enclosures, Regal Patios & Carports also specialise in the construction of decks. We have been providing homes with our expert services since 1993 and we have helped increase the aesthetic appeal of many houses and helped enhance families’ outdoor living with the installation of a deck. 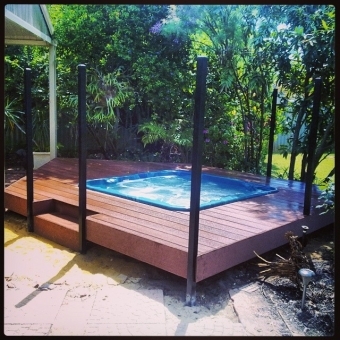 Decks can be made of genuine timber or from a timber composite. 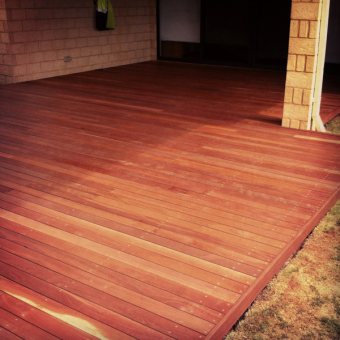 If you have a specific material you would like us to use for the deck though, we can accommodate your request. We will also be providing our expert advice regarding the material that will be best suited for your home. One thing is for sure, no matter what material we use for your deck this will be extremely durable, long-lasting and most importantly safe to use for the entire family. We mount the deck over a galvanized steel frame to make sure all these requirements are met. At Regal Patios & Carports we make sure we meet your deck specifications, requirements and needs. With our expert craftsmanship we will ensure that your family will enjoy the enhanced look and functionality of your newly decked home.